The Tiertime UP300 is one of our picks for Editor's Choice of Spring 2019. 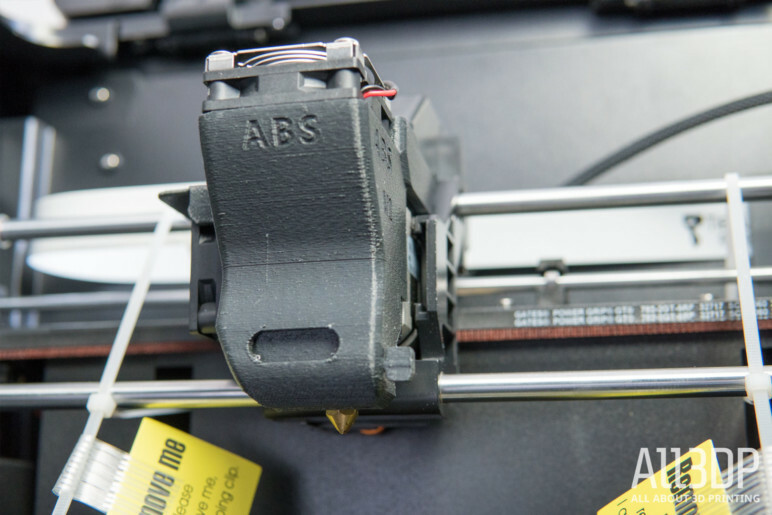 Check out our review to learn more about this versatile workhorse of a 3D printer. Debuted at the Rapid + TCT show back in April 2018 as one of three new 3D printers, the UP300 sits as Tiertime’s mid-to-top spec desktop professional 3D printer. Above the education-friendly and portable UP mini 2 ES, but below the sprawling X5 production line-in-a-box, the UP300 marks a mature proposition for those in need of assuredly quality prints — both in terms of accuracy and finish — from a convenient to use machine. Introducing a range of features not found Tiertime’s previous desktop machines, the UP300 has interchangeable print heads and two removable double sided glass print beds. With a tall impenetrable looking case enclosing the print volume, HEPA air filter and full-size USB input on the front, it’s clear the UP300 is suited more to the office space than the garage. Certainly, the $2,199 price tag would appear to back this up. Read on for our impressions after a fair whack of time using this multi-print headed hydra of a machine. Solid all-around printing performance. Flawless ABS prints. 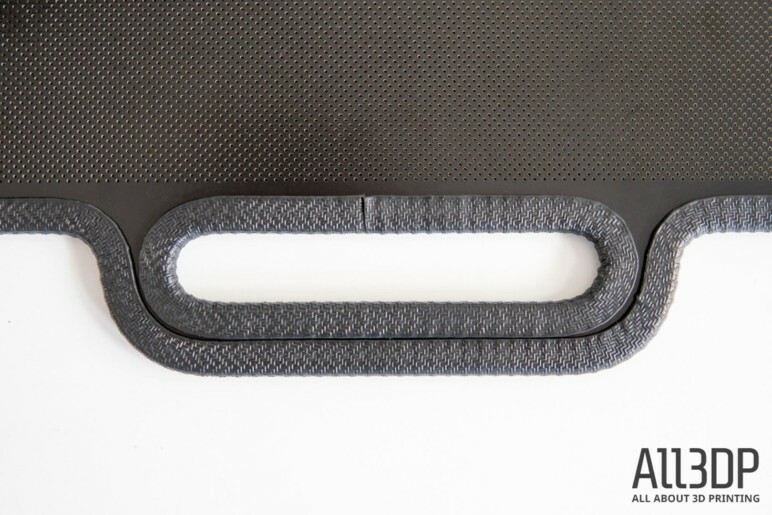 Characteristically excellent ABS prints pair with PLA and flexibles and a slew of quality of life features to make the UP300 a friendly fixture in the office. 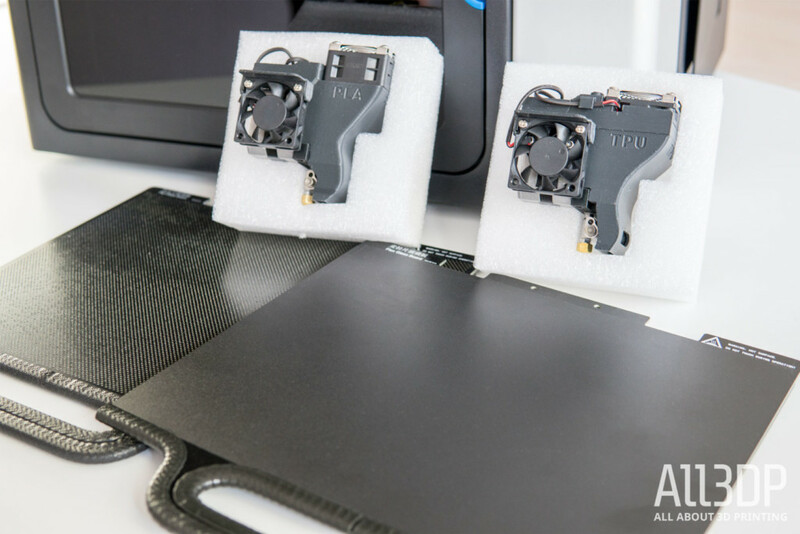 As is Tiertime’s wont, the UP300 boasts a closed box design that contributes to the successful printing of ABS and other temperature-sensitive materials. Overall this design leaves you with a monolithic box of a machine that as a functional office tool fits in, but by no means blends into the background. The UP 300 is big. Retailing for $2,199, the Tiertime UP300 is sheet metal everywhere, resulting in a significant weight that helps root the machine to the desk. A necessity, given how aggressive the printer’s motion can be, especially in travel between extrusion paths. As with Tiertime’s previous desktop efforts such as the UP Box 2 and UP mini 2, everything integral to the printing is sufficiently tucked away out of the user’s path. Out of the box you are provided with three material specific print heads. 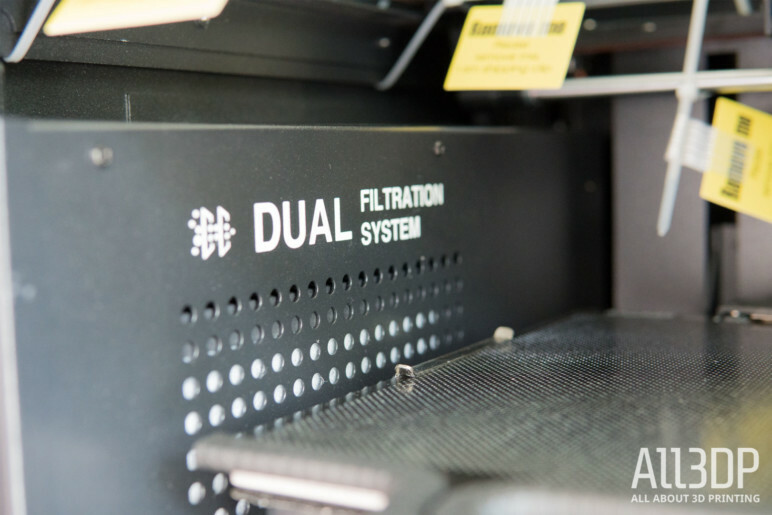 Designated “ABS” (which comes installed on the printer), “PLA” and “TPU”, each head is broadly tailored to a group of materials. Respectively these are high-temp, low-temp, and flexible. You are not limited to the three named materials. Swapping the heads is a simple act of unplugging a ribbon cable from the installed head and unscrewing an M4 screw in the left-rear of the print head. Slot the new head into place with a satisfying snap thanks to a guide magnet, bolt in and ribbon cable up and that’s it. With each change of the print head and nozzle, some small configuration changes are required in Tiertime’s UPStudio slicer. A small selection of brass nozzles accompanies the UP300, giving greater choice in the possible applications using the different print heads. The standard 0.4mm for general high-quality printing in ABS and PLA is present as default on these respective heads. You also get 0.5mm and 0.6mm nozzles, for flexibles and high-speed printing, plus a 0.2mm piece for high detail work. You have a modest build volume to work with on the UP 300; 205 × 255 × 225mm. Marginally larger than the Original Prusa i3 MK3 and Zortrax M200, it is smaller than the likes of the Lulzbot Taz 6 and Raise3D Pro2, all printers we consider to be direct competition for the UP300. Underpinned this print volume is the UP300’s brace of removable double-sided print beds. 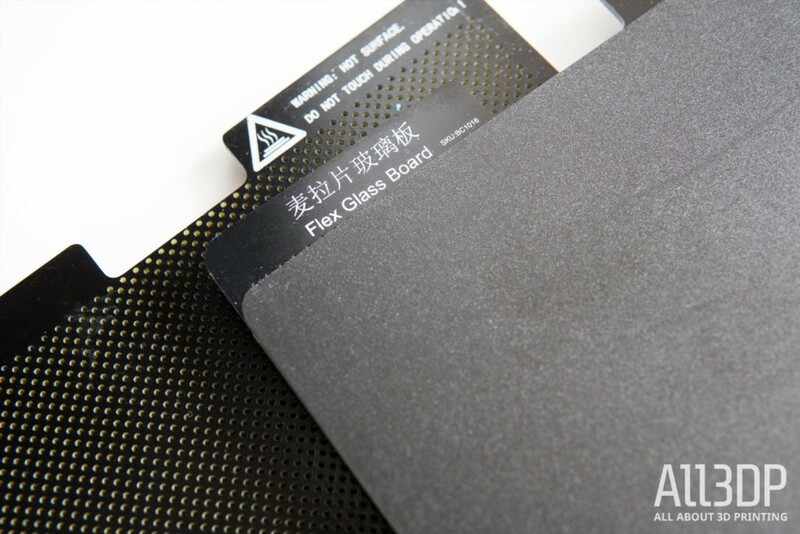 One features a textured grip sticker backed with glass, tailored more toward lower temp materials like PLA and TPU. The other, with Tiertime’s signature perf board and, again, backed with glass, grips ABS like a briefcase full of cash. This latter board is a hallmark of machines designed for ABS, and on the UP300 it works exceptionally well. Amplifying the usefulness of these boards is their ease of removal from the machine, sliding out of their guiding clips with a satisfying schnik. Interacting with the UP300 comes at the expense of a sluggish touchscreen display on the top corner of the machine. Without the aid of a stylus (not included), interacting with the printer in this way is a drag. A patch released during our time with the printer improved the responsiveness of the display, but not by much. For direct control of most of the printer’s features and print job-specific configuration, you can turn to Tiertime’s proprietary UPStudio software which lets you pipe prints to and control the printer via WiFi. Unfortunately, a similar sluggishness is experienced here. There’s a roughness to the program that occasionally frustrates the print preparation process. Whether using UPStudio to control the printer via your WiFi network or the color touchscreen, do not expect to flip through the UP300’s functions and menus with abandon. Which is pretty ironic, given how blisteringly fast the UP300 seems to print. Print preparation inside UPStudio is a straightforward affair, with Tiertime wresting the vast majority of print settings away from the user. 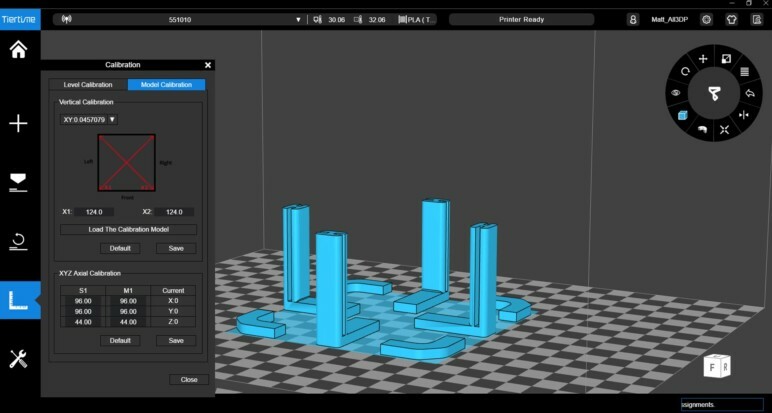 Preferring instead to let its algorithms fill in the blanks — a common sight on 3D printers tilted for the professional/enterprise workspace — we presume this is to let you concentrate less on the act of printing and more on other things. Hobbyists itchin’ for a tinkerin’ need not apply. One way in which this manifests itself is the four print speed options you are given: Normal, Fine, Fast, and Turbo. They are not explained insofar as to convey what specific parameters and adjusted settings for each — that’s all taken care of out of sight in the material profile manager, away from your traditional print settings. Thankfully, the names are self-explanatory enough. Printing using Fine the slowest and least likely to feature errors on the surface of the model. Turbo — the best name ever for a print mode — prints fast. Really fast. And, surprisingly, does not suffer from as dramatic a drop in quality as you might expect. One consequence of the UP300’s rigid motion system and predisposition for speed is that we found the belts to skip on occasion. After consultation with the manufacturer, the fix transpired to be lubrication. The rods needed grease — and lots of it. Speaking of grease, in the few weeks the UP300 has sat in the All3DP office, we’ve witnessed a pool of the stuff collect inside the machine, seeping onto the frame and generally making it a greasy affair to reach the power switch. Looking into the material profiles prepared by Tiertime, there’s nothing to suggest that the actual print speeds achieved by the UP300 are faster than other professionally-pitched machines. It’s possible that Tiertime’s slicing engine does an efficient job crunching the numbers, spitting out unusual tool paths that result in faster prints. Special mention in this review is reserved for Tiertime’s inclusion of advanced calibration options for achieving higher accuracy prints. 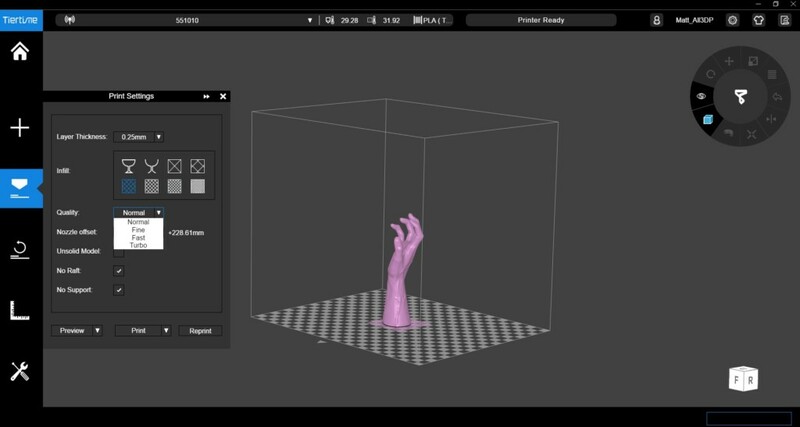 Where some print settings in UPStudio are a little difficult to broach, the XY/Z and model precision calibration routines are clear and easy to follow, giving you an accessible route to correct any dimensional distortions. You have two options for correcting distortion in your prints on the UP300. The first, the XY/Z calibration prints out a baked-in STL consisting of four “L” shaped towers. With a pair of calipers, you measure various points of the print and input the findings into corresponding boxes in UPStudio that the UP300 then takes as an offset for future prints. Alternatively, should you wish to make a quick adjustment without having to wait for a test print and subsequent measuring, you can also input the expected dimensions of a print and the actual dimensions of your print — which the UP300 can then also use to calculate an offset for subsequent prints. In testing, we found this not to perfect a print, but assuredly nudge the dimensions in the right direction. It’s a fabulous feature that underlines the Tiertime’s intent for the UP300 as a professional machine for prototyping and possibly even end-use parts. Such intent perhaps oversteps a little in the obfuscation of print settings behind the material profile manager. The act of printing itself inside UPStudio gives you a relatively lean experience, choosing the layer height, print “quality”, infill density and whether to have supports and a raft. To make the minute adjustments needed for fine-tuning a new material profile requires you copy an existing material profile, define the profile’s baseline attributes such as temperature, filament density, shrinkage rate), and then add nozzle sub-profiles, each with their own sub-sub-profiles that correspond to the aforementioned print “quality” options. Given the UP300 is still very early on in its lifecycle, there currently aren’t any resources out there (or at least none that we’re aware of) for downloading pre-tested material profiles. If you plan to switch between materials often, be prepared to spend a lot of time honing profiles. In the UP300, Tiertime has made some effort in providing a hardware solution to reliably print different materials that have differing requirements from one another. Carried over from the company’s previous UP Box+, Tiertime opts for a a system of interchangeable tool heads rather than a one-size-fits-all extruder system. 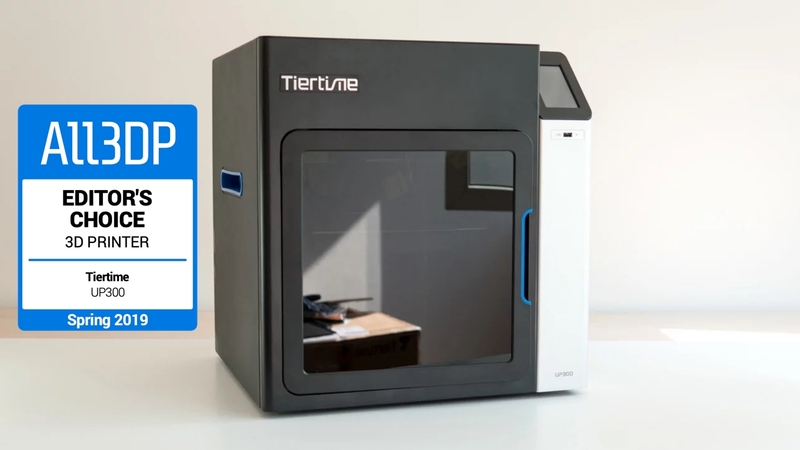 Similar in concept to Ultimaker’s Print Core system, which lets you swap the two hot ends in the company’s top line 3D printers, Tiertime’s alternative expands out to the entire print head, extruder motor et al. 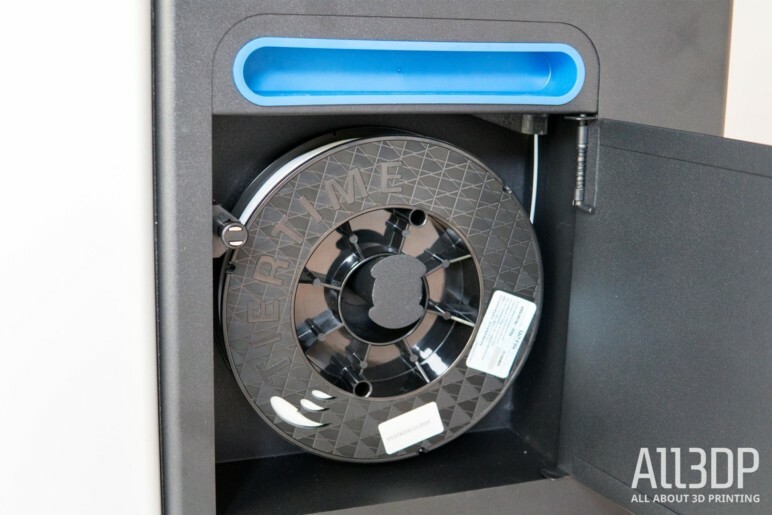 This has the benefit of meaning all materials feed via direct drive, which theoretically allows for greater filament control and better print finish. We can attest to that last part. One downside of lugging the extruder motor on the print head is mass and fine control of that mass. All the more impressive for Tiertime then in crafting a motion system that can sling this weight about at speed with little visible effect on prints. 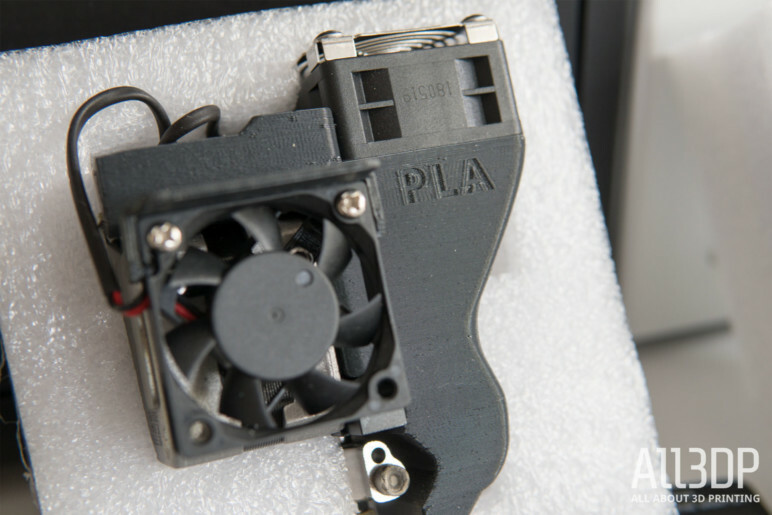 Included in the box with the UP300 are three generalist print heads: ABS, PLA, and TPU. Each claimed to have been fine-tuned to play to the perks of a given subset of materials. 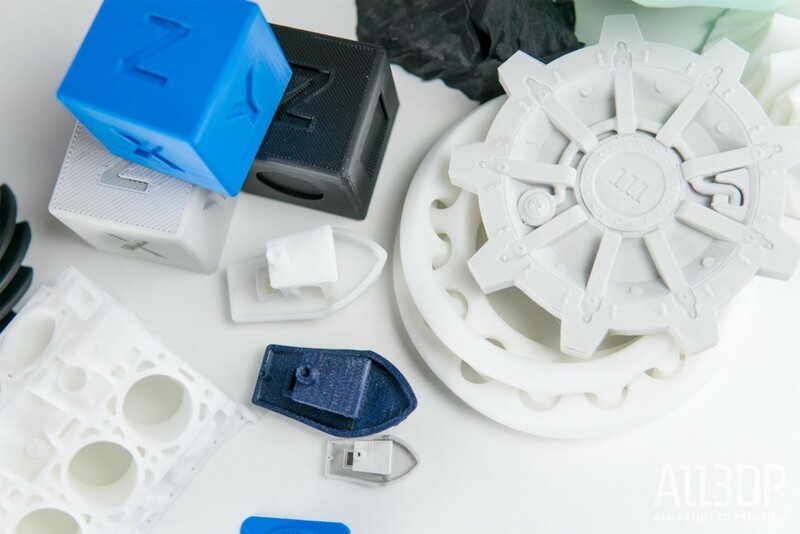 There’s no documentation with the printer explicitly stating it, but we imagine the PLA print head to feature a PTFE lined hot end, and the ABS print head an all-metal hot end. The only externally noticeable difference between the two is different cooling fan ducts. There’s no documentation with the printer claiming different temperature ratings, so it’s no stretch to think that they are fundamentally the same, with the reasoning for splitting them up being to prevent cross-contamination and burning of the remnants of lower temperature materials when switching from PLA to ABS. The argument for proper printer maintenance and regular cleaning of the nozzle when switching between materials renders this moot, but for sheer convenience and not having to get your hands dirty, we prefer Tiertime’s solution. The TPU print head most likely features a better-constrained filament path between extruder motor and nozzle, leading to a consistent performance in prints requiring frequent retractions. In practice, the three printheads work. Which sounds underwhelming at face value, but really the absence of any standout notes printing with the three of them is a compliment in itself — there are no quirks or road bumps using the three. You simply make the switch and continue printing. There have been no confirmed plans as yet, but such a system is ripe for expansion. An abrasion-resistant high temp head or, at the expense of some print volume, a dual extrusion head could make the UP300 an irresistible proposition. Tiertime UP300 Review But is it Worth it? In the UP300, Tiertime is taking a shot at the small business/prosumer market, sidling up to the top table with the Taz 6’s and Ultimaker 3s of the world, with a cursory nod and reaching for the bread basket. Two names spring to mind for superior ABS printing — Zortrax, and Tiertime. In the UP300 Tiertime has blasted into the lead, with better heat regulation from a closed box design as standard, HEPA and active carbon filtration for air purification and a removable bed for easy removal of the stubborn (but necessary) rafts. Add on the flexibility of material specific print heads — which precludes the possibility of new, feature expanding printheads in the future — and you’re left with a highly versatile machine that not only undercuts much of the competition but in some areas even outshines them. You can purchase the Tiertime UP300 from the retailers listed below. The supports generated by UPStudio snap off by hand with no visible trace on the final part. Creating material profiles in UPStudio is cumbersome. Not conducive to making quick trial-and-error adjustments. The UP300 gladly gobbles up 3rd party filaments — a wide variety of spools fit in the printer’s filament bay, but some 1kg (and all oversized) rolls will need desk space and an external spool holder. There are plenty of nooks and crannies for the print head-securing M4 screw to disappear into when making a switch. Beware. The air filter rocks. 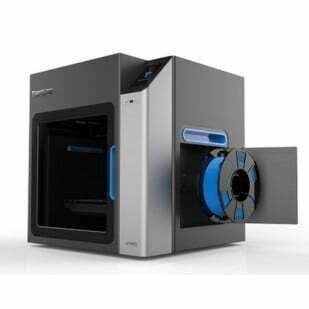 It makes printing with ABS virtually odorless. UPStudio sometimes adds tiny supports and rafts for small severe overhangs. We generally found this to be unintrusive and effective. 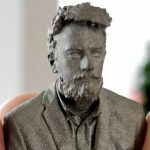 License: The text of "2019 Tiertime UP300 3D Printer Review – ABSolutely Fabulous" by All3DP is licensed under a Creative Commons Attribution 4.0 International License.